There is nothing like waking up to the sight of the sun rising over the ocean. 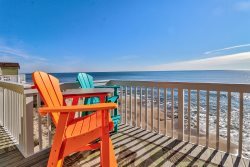 Relax out on your deck with a cup of coffee and watch the dolphins swim by. Oceanfront - it can't be beat.